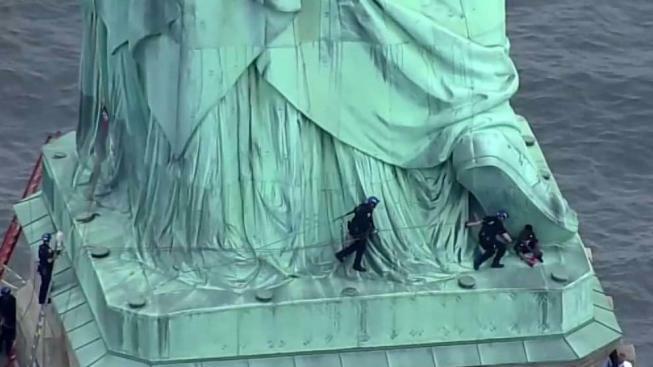 A woman who climbed the Statue of Liberty after participating in an "Abolish ICE" protest has been captured after police attempted for hours to coax her down. The woman, identified as 44-year-old Therese Patricia Okoumou of Staten Island, scaled the statue after protesters from Rise and Resist New York unfurled an "Abolish ICE" banner there; she made it to Lady Liberty's base. Liberty Island, crowded with visitors on the July Fourth holiday, was evacuated as police responded and attempted to coax her down. Okoumou was seen at various points pacing back and forth on the base of the statue, then lying down and casually kicking her legs. Police officers watched from below as they attempted to coax her down, then brought out a ladder and other climbing gear to physically get to her. NYPD's highly trained emergency services and aviation units responded along with U.S. Park Police. Hours after the response began, two ESU officers, Detectives Brian Glacken and Chris Williams were able to make it onto the base where Okoumou was. "We just tried to get a dialogue with her while she was up there," Glacken told reporters at an evening briefing, saying the woman was talking about "the children in Texas." She was combative and unfriendly at first, threatening to push the officers and the ladder off, Glacken said. But the officers were persistent and continued speaking with her, and were able to establish a rapport with her. "I think the turning point was when we got her, she couldn't go any further, and I think she realized her time was up up there," Glacken said. "She actually apologized to Chris and I for having to go up there to get her," he added. The rescue was also highly technical because of the slopes and angles around the base of the statue: "There was nothing for Chris and I to grab onto," said Glacken. "So that high point, and trusting the equipment that we have and trusting the guys behind us, is what made it work." Sixteen ESU officers in total were staked out at the statue during the response. Earlier, seven people were arrested by the United States Park Police after unrolling a banner that read "Abolish I.C.E.," at the statue. The banner was organized by the group Rise and Resist NYC, which said on Facebook it was at the Statue of Liberty to demand President Donald Trump abolish the U.S. Immigration and Customs Enforcement agency and "reunite families, halt deportations and end detention as a deterrent." The group initially denied any connection to the climber, saying in a tweet, "The climber on the Statue of Liberty has no connection to our #abolishice action earlier today." But a Rise and Resist member named Annette Guadino who participated in the banner unfurling later confirmed to News 4 that the person on the statue had been part of their protest. "While the people who were doing the banner were taken and detained by park police, we became aware that there was a climber on the statue," she told News 4 at the Battery, after getting off the ferry from Liberty Island. "We did not know until just now, just a few minutes ago on the ferry when someone showed us a photo and we were able to confirm that it is a Rise and Resist member who took this action on her own." "She did not discuss it with anybody beforehand, and we were completely unaware," said Guadino. "We found this out through the same way everybody else is finding it out, through the news." Though Guadino said the group supports the woman and "certainly understand the feeling that motivated her to do this," they were very concerned for her safety. A statement issued later by Rise and Resist called Okoumou an "amazing woman." "Patricia is our friend, our comrade, our sister," the statement said in part. "From the moment that we realized that this amazing woman whom we have gotten to know, love, and respect was the person who had climbed to the foot of Lady Liberty, we had three concerns: one for her safety from falling, second, for her safety as a woman of color who was about to be engaged by law enforcement, and third, to find her the best legal representation that we could." The seven protesters will be charged with unlawful protest, U.S. Park Police said. 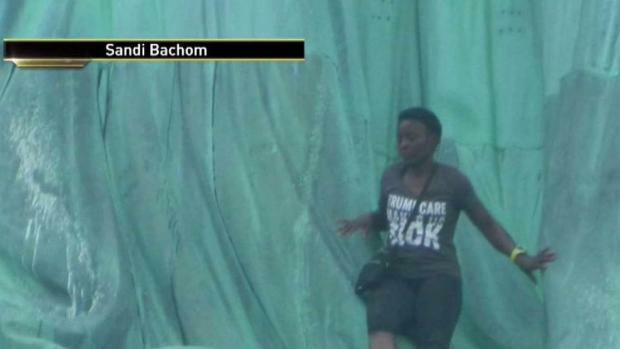 Okoumou is facing federal misdemeanor charges including trespassing, disorderly conduct and interfering with government functions, according to the National Park Service. Some Liberty Island tourists ferried back to the Battery after the evacuation were upset about having their visits interrupted. "We had just gotten on the island, we walked probably five minutes and all of a sudden, they're shuffling us out. We didn't even spend 10 minutes," said one woman from Columbus, Ohio. Another man visiting from Miami with his family said the protester "ruined our visit." "It's not every day you get to go to the Statue of Liberty on the Fourth of July," he told News 4. "At first we thought it was a terrorist attack, and then we found out it was a protester... I think there is a right way of protesting, a legal way of protesting, and she just ruined our trip." Others said they weren't too upset and supported the protesters' message. Authorities said they're investigating the method and means of a possible security breach that allowed the woman to get to the base of the statue. Rise and Resist members who know Okoumou said she simply free-climbed, remarking: "She must be very skilled." The protest comes a week after a Wisconsin congressman introduced legislation to abolish the U.S. Immigration and Customs Enforcement agency in a demand for change that has become a campaign cry for some Democrats this primary season. Guadino, the Rise and Resist member who participated in the Statue of Liberty protest, said, "The tearing apart of families, the militarization of the border, the deportations of people who have been living in their communities and working hard for decades, being ripped away from their families -- it's completely unnecessary, it's a manufactured crisis, and it stands against everything that the Fourth of July and the Statue of Liberty stand for." "So we understand that people were inconvenienced today, and we're also concerned for the safety of the woman that is climbing, but sometimes you have to be daring to get the message out," she said.